Stone Barrington, his new girlfriend Kelly Smith, and his friends Viv and Dino Bacchetti are in Key West hunkering down waiting for a category five hurricane to hit the neighborhood. During the storm, the front door is blown open and a soaking man is hoisted into the room. It turns out he is the junior senator from Florida, Joe Box, a noxious character who has shady dealings with the Russians and others. He is also a predator who sexually assaulted Kelly. Another visitor arrives: Dame Felicity Devonshire, head of the British foreign intelligence service MI-6, and the former owner of Stone’s house. She accuses Stone and his compatriots of being involved in a conspiracy to subvert international law. He and another man in on the plan, Lance, call her observation wrong. Felicity brings devastating news to the collected group: Selwyn Owaki has gone nuclear. "With his usual verve, Stuart Woods brings a sense of reality and candor to his latest effort. The suspense is ratcheted very high, and fans will surely enjoy this perfect summer read." The group has been invited to a dinner party at which Owaki, a wanted man, will appear. He tried to kill Stone a while ago, and the powers that be believe he is up to no good. A bomb may be in his possession, or a similar type of weapon is hidden among his belongings. As the story continues to unfold, Stone and Kelly embark on a mission to stop Owaki and, if possible, take possession of the check, which will be Kelly’s if they can get their hands on it. With his usual verve, Stuart Woods brings a sense of reality and candor to his latest effort. The suspense is ratcheted very high, and fans will surely enjoy this perfect summer read. 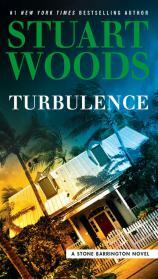 TURBULENCE is Woods’ 46th Stone Barrington novel and is sure to rank as one of his best.